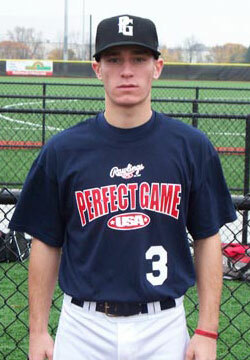 Keith Moyer is a 2010 RHP/MIF with a 5'9'', 155 lb. frame from Souderton, PA who attends Souderton. Lean athletic build, room to fill out, good arm speed on the mound, athletic delivery, fills up the strike zone, nasty 12 to 6 curveball with hard downward life, curveball is potential plus pitch, pitches with confidence, aggressive hitting approach, line-drive contact, good pop to the opposite field, clean infield acions, strong arm, hands and feet work.